Adaptive reuse should be the default, and demolition a last resort. Historic preservation encourages cities to build on the assets they have—unleashing the enormous power and potential of older buildings to improve health, affordability, prosperity, and well-being. Ultimately, it’s the mix of old and new buildings, working together to fashion dense, walkable, and thriving streets, that helps us achieve a more prosperous, sustainable, and healthier future. By transforming the places we live to places we love, older buildings are a key and irreplaceable component of this future, and we are richer and stronger when they remain. We all have places that matter to us—places that define us, places that challenge us, places that bring us together and tell our story. These places help form our identity and our communities. They create opportunities for growth and help us feel at home. They explain our past and serve as the foundation of our future. These special places arise organically where people choose to come together, and from the local stories they treasure and wish to see persevere. But when older buildings are destroyed, the engine that keeps neighborhoods growing, innovating, and thriving is disrupted. Fundamental to ReUrbanism is that building reuse encourages economic growth and stimulates vibrant communities. Our Ten Principles for ReUrbanism outline this important work. As the National Trust’s ReUrbanism initiative seeks to support the successful, inclusive, and resilient cities of tomorrow, the Atlas of ReUrbanism is a tool to help urban leaders and advocates better understand and leverage the opportunities that exist in American cities. The Atlas makes the massive amount of data currently available about cities more accessible, allowing for the exploration and discovery of connections between older buildings and economic, demographic, and environmental outcomes. Whether you’re a mayor, planner, developer, activist, or journalist, the Atlas contains useful information about the businesses and residents, buildings and blocks that make cities work for everyone. 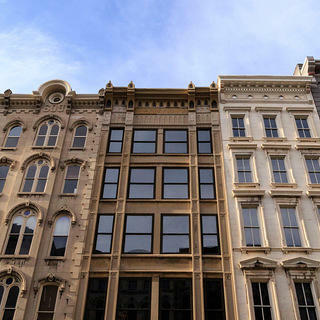 With a rich history dating to its early role as a trading center along the Ohio River, Louisville contains a remarkable collection of historic structures and older neighborhoods. By creating an urban laboratory there to test creative approaches to preservation, the National Trust and our local partners are seeking to create a sustainable preservation model for other cities across the nation. The Research & Policy Lab connects old buildings with new ideas. Guided by the belief that older buildings and blocks are essential to creating sustainable, equitable, and affordable cities, the Lab conducts research, delivers tools, promotes policies, and convenes partners to deliver a new kind of economic development leveraging existing buildings and underutilized spaces. Former National Trust president Stephanie Meeks explores the many ways that saving and restoring historic fabric can help a city create thriving neighborhoods, good jobs, and a vibrant economy. With a commercial district which was built out primarily in the 1920s, Jefferson Avenue on the Lowereast side of Detroit was once a vibrant and thriving residential and business community. And it intends to be so again. QUIZ: Which Side Of Jane Jacobs Are You?